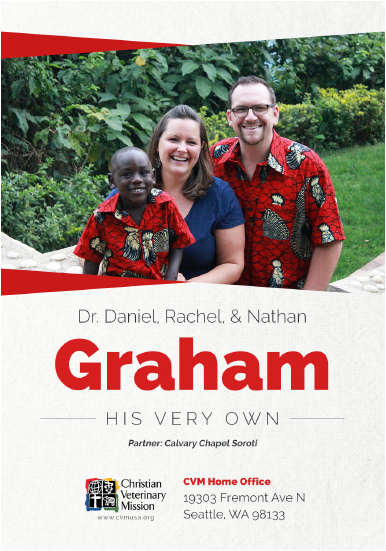 I (Daniel) just returned last week from a 2 week trip to the SW corner of Uganda. The SW is an area where we have worked on various projects since we moved here in 2012. We try to make it down 2 or 3 times a year. We would go more frequently, but it is a full 2 days of driving just to get there, so it takes some planning to make these trips happen. Since Nathan is in school, Rachel decided not to come on this trip so that he wouldn’t miss so much class. Here are a few photos from the trip. About halfway through the 2 day drive, we cross the equator going south. On this trip, I was traveling with Mike, a vet from WA, and Fred, one of my former students who graduated from the School of Ministry last year. This is one of my favorite places in Uganda. The road to Kisoro snakes through the mountains and the town is at the base of these 3 volcanoes. On the back side of these 3 volcanoes is Rwanda. To the right, there is the outline of more mountains and a 4th volcano which are on the Congo side of the border. Our first stop was Rukeri, on the slope of the largest of the 3 volcanoes. This is a Batwa settlement where we gave out sheep loans in October of last year (on the trip with the School of Ministry students). The community brought all the sheep to show us. Some already have lambs that have been given back to the group as their loan repayment and the lambs have gone to other members of the community. One day, every family in the village will have a sheep of their own as they continue to work together! While we were there, we dewormed all the the sheep and their lambs and put on ear tags. The whole community came out to watch the free entertainment. With funding from Mike’s Rotary Club in WA, we started a new sheep loan group for Batwa that have moved out of the slums in Kisoro town. I have known many of these participants for several years and it is a lot of fun to be able to participate in their lives. Before going to their new homes, each sheep was given a dewormer, sprayed for ticks, and given a numbered ear tag. To keep everything fair, each participant randomly draws a number that corresponds to the numbered ear tag on the sheep – that is the sheep they get to go home with. Check back tomorrow for more photos from the second half of the trip! Daniel, great picture tour of SW Uganda. I’m looking forward to Part 2. It was especially fun to see the first picture at the equator. We went there in 2010 on an after-Timothy tour of part of Uganda. We got our pictures taken at the same place. Blessings as you continue working with and loving the Batwa. Hi Daniel, So glad to see you doing what you do so well! Much love . . . with my prayer for you, Rachel and Nathan.